I'm delighted to be hosting the September 2017 Jewish Book Carnival! 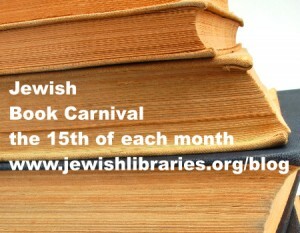 The carnival, which appears on the 15th of each month, brings together an assortment of information on books with Jewish themes. On IsraelBlogger.com, Batya Medad reports: The fascinating story of the early years of the town Mazkeret Batya is told to us by Sam Finkel in Rebels in the Holy Land. Not only did I learn the history of that very special town, but I discovered so much of what I had never known about the history of settlement in the Land of Israel before Herzl and Zionism. On her blog, My Machberet, Erika Dreifus routinely curates pre-Shabbat Jewish literary links. Here’s one recent batch. Barbara Krasner at The Whole Megillah interviews author Lisa Schulman and her Boyds Mills Press senior editor, Mary Colgan, about a new novel, Stolen Secrets. And I interviewed Elizabeth Rosner about her new book, Survivor Café: The Legacy of Trauma and the Labyrinth of Memory. --Many thanks to the bloggers who participated in this Carnival!